I’m so grateful for my new Synergist Saddle! I’ve been pleased from the time I opened the box delivered from UPS. The saddle is absolutely beautiful. I’ve bought four new saddles in my lifetime and none compare to the Synergist. I have the saddle on display in my family room and just love looking at it. I was able to ride in it a couple hours and I’m very pleased the saddle fits me and Cody perfect. I was surprised I didn’t even have to adjustment the stirrups that’s how perfect it fit. I cannot wait for spring I hope to do a lot of trail riding this year!! I purchased my three year old Rocky Mountain Horse (Cody) in the spring of 2014. I started riding him in a Tucker wide tree saddle it seemed to fit Cody OK, but I wasn’t happy with how it fit me. I sold the Tucker and bought a Brenda Imus saddle with a wide tree off line. I liked how the saddle fit me and it seemed to fit Cody so we started trail riding. Cody was a very good boy, he would stand quietly on the side of the trailer as I saddled him and would stand perfectly still for me to mount. After a few trips that all changed, Cody would not stand for me at all. I’ve had horses all my life and trained quite a few, but I’m now 54 years old and I was starting to think I made a mistake buying a young horse. And it only gets worse! Cody started tripping & stumbling a lot he even fell to his knees four times with me while riding. It wasn’t until I was taking with a friend about the timing of Cody’s behavior change that we came to the conclusion it was the Imus saddle that was the cause of Cody’s behavior change. I felt horrible! Cody was trying to tell me the saddle was hurting him. I stopped riding him in the Imus saddle and I ordered a new Hedgpath saddle witch was custom fit to Cody by placing different tree’s on him and taking photos and the saddle maker picked the tree he felt was correct. Well, long story short I got the saddle and I was not happy with how it sat me and it did not fit Cody at all. The saddle rolled off Cody’s back when I tried to mount or dismount. So after I tried some different saddle pads and still was not happy I sent the saddle back, I also sold the Imus saddle and then I ordered my new synergist saddle. 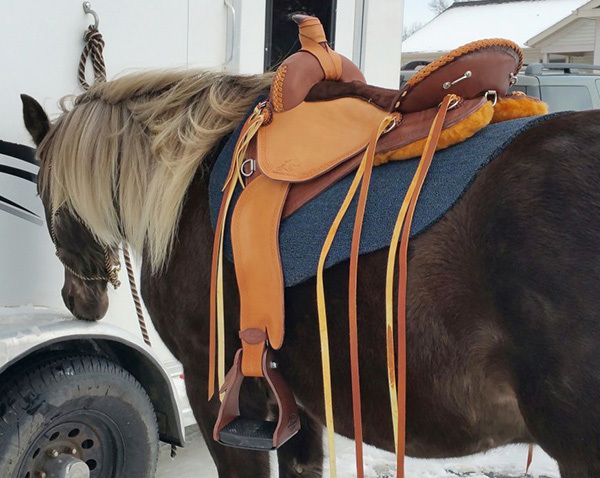 The EQUImeasure kit is a wonderful tool to accurately fit a saddle to your horse and Synergist custom fitting the seat for me finally I have a saddle that fits my horse and me. I couldn’t be happier with my new Synergist Saddle! I Love my new Synergist Saddle!